We spend a fair amount of time each day working with customers to determine which Windscreen options are the best fit for their facility. That’s because there are just so many different options to choose from. What shade factor – or level of privacy – am I comfortable with? What color is best for my court? Do I want my “team colors” or a standard black or dark green? What height is optimal for playability at my facility? Do we want our logo on the screen…and if so, how big…and in what color(s)? Do I want a less expensive, “do-it-yourself” screen that may more often be in need of repair or replacement? Or more durable, fully customized screen that is fit to my exact specs? As you can see, the list of options goes on and on…leaving you stumped as to where to start. Luckily, that’s where we come in to help! There are four basic decisions that you have to make when it comes to deciding which type of windscreen to purchase. The first decision that you need to make is whether an open mesh windscreen or a closed mesh windscreen is more appropriate for your facility. Most windscreens are purchased in order to (a) provide a good backdrop to visually pick up the ball (b) provide some protection from the wind (c) provide a small measure of privacy for the court. For most tennis court applications, an open mesh windscreen is ideal. Open mesh windscreens provide 70%-80% visual and wind block and provide an excellent visual backdrop for the tennis ball. If you are purchasing windscreen to block out an unsightly area or to provide a high degree of privacy, a closed mesh windscreen is probably more appropriate. Closed mesh windscreens provide 90% to 100% visual and wind block. These windscreens will provide a higher level of privacy. However, they cannot be used in very windy areas as they exert too much pressure on the fencing. The second decision you need to make is to decide if custom cut windscreen or cut-to-size windscreen is better for your facility. Cut-to-size windscreens are sold in rolls. These rolls are 6′ or 9′ in height by 120′ or 150′ in length. The advantage to cut-to-size windscreens is that you do not need to know the exact dimension of the fencing to place your order. You simply roll out as much windscreen as you need (10′, 20′, 30′ etc.) and then use a utility knife or razor to cut the windscreen. Some cut-to-size windscreens are available with grommets in the top and bottom of the screen to make installation easier. Cut-to-size windscreens are also less expensive than custom cut windscreens. Custom cut windscreens are made at the factory to exactly fit the dimensions of your fencing. You provide us with the height and the length of the screen you need and we have the windscreens manufactured at exactly those dimensions. The big advantage to custom windscreens is that they look fantastic and provide a very professional appearance to your facility. All four sides of the screens are bound and include brass grommets for easy installation. However, there are few downsides to custom windscreens. First, you need to take the time and effort to measure the fence before you can order your screens. We have included this easy to follow guide (link to how to measure windscreens page) to make this process easier, but it still takes effort. Second, custom windscreens are more expensive then cut to size windscreens. The third decision you need to make is what material type/grade of windscreen is most appropriate for your facility. All cut-to-size rolled windscreens are made from the same type of material – polyethylene. If you have decided to purchase cut-to-size rolled windscreen, you simply need to determine whether you would like a 70% shade factor (Windshade), 73% shade factor (10-Shade) or 95% shade factor (Enviroscreen). The Windshade and 10-Shade products are generally used for typical tennis applications whereas Enviroscreen is generally used for privacy or block-out screen. If you have decided to purchase a custom-cut windscreen, you will need to choose between polypropylene, vinyl-coated polyester (Tenn-Air/VCP) or heavy-duty vinyl-coated polyester (ProScreen/Royale). Polypropylene is the lowest cost custom-cut windscreen available. It is very popular with cities and municipalities and works well in heavy wind areas. It is not as attractive as the higher grade vinyl coated polyester windscreens because the linear weave of the product is visible. Vinyl-coated polyester is the workhorse of the custom-cut windscreen class. It is very popular throughout the Midwest and in many resort and country club applications. These products look great and work well. The top-of-the-line custom cut windscreens are the heavy-duty vinyl coated polester windscreens – ProScreen and Royale. These windscreens last the longest and were specially designed to stand up to the sun and humidity experienced in the southeast, particularly Florida. This heavier material also hangs really nicely on the fencing and is the choice of most high end country clubs, resorts, condominiums and private homeowners. The last choice you need to make is color. Most windscreens come in two standard colors – dark green and black. Dark green is the most popular color, but Black has made big inroads in the last few years as many new tennis courts are built with black fencing. Depending on the product chosen, other colors (blue, red, orange) may be available. We have included the following diagram to give you an idea of which facilities generally purchase which types of windscreen. If you have other windscreen questions, please feel free to give us a call (800) 247-3907 or fill out an information request form. For a look at the full line of tennis court supplies we offer, visit us online – 10-S.com. We can definitely help with the pickleball court windscreen. Since all windscreen is special cut for each court, you have to actually speak to a team member here at 10-S Tennis Supply to provide your exact dimensions. We are located in Pompano Beach, FL and do the measuring for local customers, as needed, but your measurements would have to come from you directly since you are too far to send someone out from our office. The number here is 800-247-3907. Thanks! LOOKING FOR CONTRACTOR TO INSTALL SUNSHADES AT pb COURTS IN cASA GRANDE, Az. ARE YOU ABLE TO DO THIS? I will email you Bob. Hello, we live in Cave Creek Arizona and we have a tennis court. We do get a lot of wind up here and I was wondering what type of screens would be the best for us. The ones we have now are about 10 years old and I would like to replace them. The old screens are 6ft. I would like to put 9 or 10 ft.up. I noticed that some of the courts in our area have split screens, like 5ft on top and 5ft on the bottom with squares cut out in each section, because of the wind. What is your opinion? The two best screens we carry for high wind areas are Tuffy® and Leno Polypropylene. Of the two the Tuffy® is our most popular screen. 9′ high would be the next standard height in windscreen. If you have a 10′ fence this would give the appearance of covering the complete fence. The additional 6″ open on the top and bottom allow the screen to be pulled tight and look neat. For installation it is import for any size windscreen to use break-a-way tys and with these every grommet receives a ty-rap. Also if / when one of the tys break free you would want to replace it as soon as possible. This keeps the screen from whipping free and being ruined prematurely. The sewn “squares / windows” every 5′ are good for allowing wind to pass through. This puts less stress on the screens, fence, etc. However, there is an additional cost to have the bound windows put in. Switching from 6′ to 9′ will add wind load to your fence and so it may be worthwhile to add in these “Bound Windows”. If you are interested in receiving and estimate or if you have any additional questions, please give us a call – 800-247-3907. Our City has just resurfaced five older tennis courts. The black chain-link fending that surrounds the courts is pretty old and some rust is evident at the bases of each pole. We are looking to add windscreens on the ends of each tennis court to improve seeing the ball. However, we are concerned about the wind load on these older fences that the screen will be attached to. So, we are looking to wind screens that allow the passage of high winds. The two best screens we carry for high wind areas are Leno Polypropylene and Tuffy®. Leno Polypropyolene has special reinforced threads to resist tearing and spreading, making it ideal for high-wind areas. 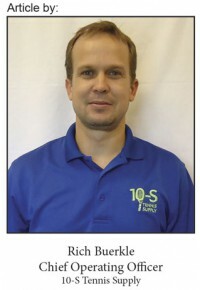 It can be found here: http://www.10-s.com/Products/Custom-Tennis-Windscreens/EJ1013. If you wanted to go with one of our more traditional screens, the Tuffy® is our most popular screen. I would recommend adding in the bound windows instead of the standard vents. The sewn “squares / windows” (every 5′ or 10′) are good for allowing wind to pass through. This puts less stress on the screens, fence, etc. However, there is an additional cost for each bound window. 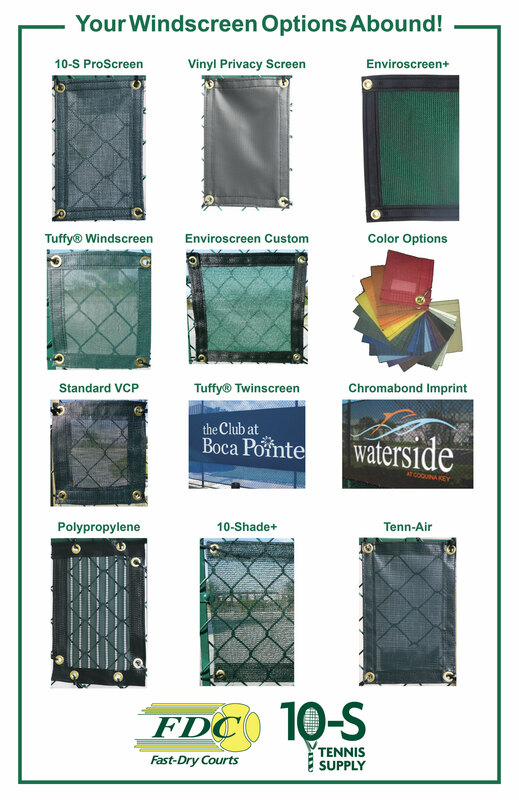 Tuffy screens can be found here: http://www.10-s.com/Solutions/Windscreens_3/ET1006.